It's not often you have the chance to bring your family to a PRCA, WPRA & GPIRA sanctioned rodeos with a view of the World's Largest Mountain Carving in progress. In fact, to the best of our knowledge the opportunity only presents itself once a year and at the Crazy Horse Memorial Stampede Rodeo & Gift from Mother Earth Art Show. The Stampede Rodeo is one of the few rodeos to offer events sponsored by the Professional Rodeo Cowboys Association (PRCA), Women's Professional Rodeo Association (WPRA) and the Great Plains Indian Rodeo Association (GPIRA). 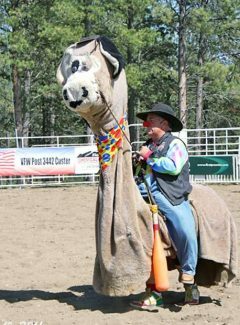 Even if you have not seen a bull buck, the animated rodeo clowns, energized announcers and talented contestants will sweep you up in the excitement of thrilling Crazy Horse Stampede arena action. The rodeo helps Crazy Horse Memorial further the goals of cultural understanding. The late Anne Ziolkowski Christensen (1955-2011), daughter of sculptor Korczak Ziolkowski(1908-1982) and Ruth Ziolkowski (1926-2014), directed the rodeo for more than 20 years. Anne underscored the importance of the rodeo beyond being a sports competition, saying, "If we can play together, we can work together." The Stampede is produced by Korkow Rodeos, a national award-winning outfit based in South Dakota. Opening the three-day event is the GPIRA rodeo on Friday, June 19. The PRCA and WPRA sanctioned events are Saturday and Sunday. PRCA slack events are Saturday at 2 p.m. after the performance and the GPIRA slack and Jr./Sr. events will take place Friday starting at 9 a.m.
•	The rodeo grounds, the day of the event. Your day at the Crazy Horse Stampede Rodeo includes admission to Crazy Horse Memorial visitor complex, where the Gift from Mother Earth Art Show takes place. This art show celebrates Native American art and crafts with exhibitors displaying and selling beautiful pieces of custom-made clothing, jewelry, sculpture work, pottery and much more. Awards are given in several art categories at the end of the three-day event. Don't miss the INDIAN MUSEUM OF NORTH AMERICA®, the NATIVE AMERICAN EDUCATIONAL & CULTURAL CENTER®; where thousands of American Indian contemporary art and artifacts are displayed. NEW this year is the American Bison Exhibit located in the NATIVE AMERICAN EDUCATIONAL & CULTURAL CENTER®. This dynamic display details the story of the bison in North America, from its prehistoric beginnings to its near extinction and the exploits of western figures that helped save the remaining bison at the end of the 1800s. You will also learn the cultural significance of the buffalo to tribes across the country. Stop in the Mountain Carving Room; and get an up-close view of how the World's Largest Mountain Carving in Progress is carved. Learn about the history of Crazy Horse Memorial and the future progress with the Dynamite and Dreams video in the visitor complex theatre. Want a closer look? For only $4 per person take the bus ride to the blasting zone at the bottom of the Mountain. Mark your calendar and join us June 19-21, for the best bull, broncs and art show in South Dakota!